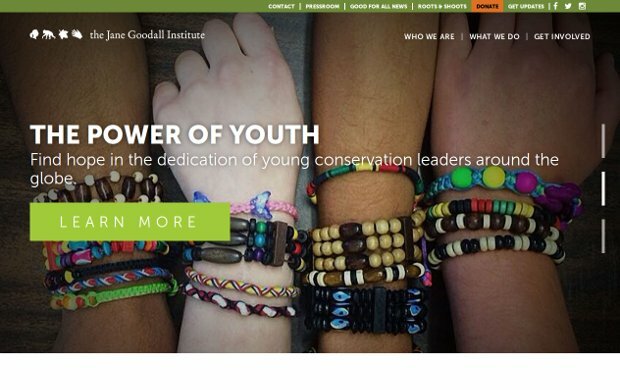 Founded by renowned primatologist Jane Goodall, the Jane Goodall Institute is a global nonprofit that empowers people to make a difference for all living things. Their work builds on Dr. Goodall’s scientific work and her humanitarian vision. Specifically, they seek to: Improve global understanding and treatment of great apes through research, public education and advocacy – Contribute to the preservation of great apes and their habitats by combining conservation with education and promotion of sustainable livelihoods in local communities – Create a worldwide network of young people who have learned to care deeply for their human community, for all animals and for the environment, and who will take responsible action to care for them. Although Jane Goodall founded the Jane Goodall Institute in 1977, its birth can be traced to the moment she stepped out of a game warden’s boat onto a pebbly beach at what was then the Gombe Stream Game Reserve in Tanzania. Chimpanzees: Jane Goodall had a daunting assignment – find and get close to wild chimpanzees, documenting their behavior to shed light on our own evolutionary past. She rose to the occasion, very quickly making the first observations of any wild animals making and using tools.She also observed chimps hunting bushpigs and other animals, disproving the widely held belief that chimpanzees were primarily vegetarians. Through subsequent years, she opened the world’s eyes to the complexity and richness of chimpanzee communities, writing of close family bonds, dominance struggles among males, human-like communications such as pats on the back and hugs, and much more.Today the Gombe chimps are perhaps the world’s best-known, and the Gombe research program represents the world’s longest continuous wildlife study.